Tie-dye fun run for a great cause – two tickets on me! I am doing it! A 5K. And even though I am out of shape (running wise) I cannot resist the urge to get literally get tie-dyed while giving back to the community. On August 23, I will be taking part in The Color Vibe 5K being held in Wascana Park at 9 a.m. Why don’t you join me? 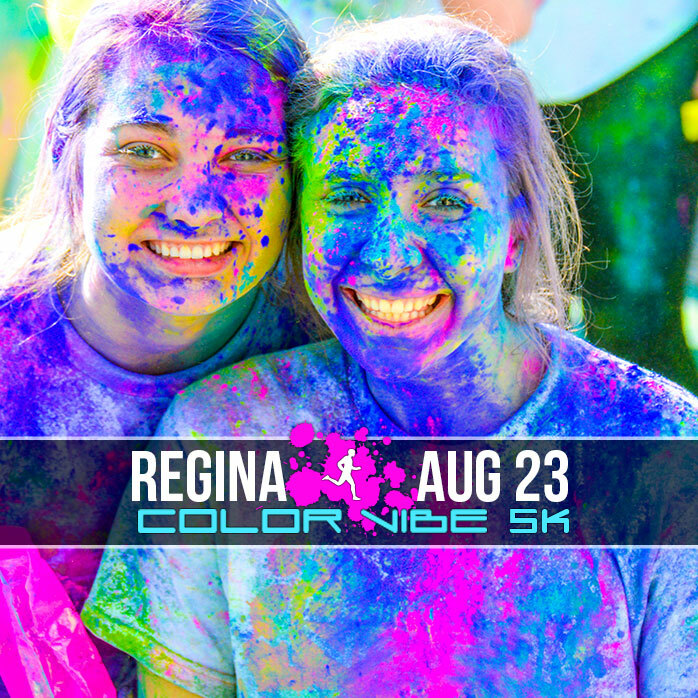 Get ready Regina for the most colorful fun-filled day of your life! You’ll have more color on you than your happy levels can handle! 1. It’s FUN. Become a self sustained piece of art! Beyond the dyes, running can be fun with a friend or family member. Plus there is a dance party post-run! 2. It’s GOOD for you. OK, you know that – but running also creates endorphins and you will actually feel good too! Or, maybe a 5K is a fitness goal of yours – here’s your chance to make it even more special. 3. It’s for a GREAT cause. Part of ticket proceeds will be donated to the Regina Humane Society. Can’t run? Don’t worry. You can walk or even dance your way through. This isn’t a high pressure run. Worried about the dye? You shouldn’t be – it is a cornstarch base, custom developed for the event. It is 100% safe, non-toxic, biodegradable and washes out easily from skin and hair. Need a bonus reason to participate? Children 12 and under are FREE, making this a fantastic idea for a family event! So who wants a couple of free tickets? All you need to do is visit my Facebook page, hit the little blue LIKE button, then comment on the Color Vibe post pinned to the top of the page. I will make the draw in early August! Best of luck to those who decide to join me. It’s going to be a blast! Register today or find out more info at www.thecolorvibe.com.